Make the choux pastry first. Method to hold the piping bag: Wrap the end of the piping bag around your thumb. Squeeze the bag with your hand to let the pastry out. Pipe the choux puffs in staggered rows on a slightly greased baking sheet. Squeeze the piping bag to create a small bun, then make a sharp, circular movement to stop. Using a fork, glaze each choux bun with egg wash. I recommend using a fork instead of a brush to avoid the egg wash dripping down, which would prevent the puffs from rising during baking. 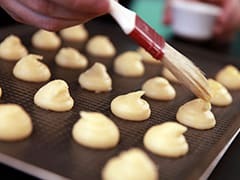 Refers to the operation consisting in shaping dough or pastry on a baking sheet or mould, particularly when piping choux pastry to create buns, using a plain or fluted piping bag.